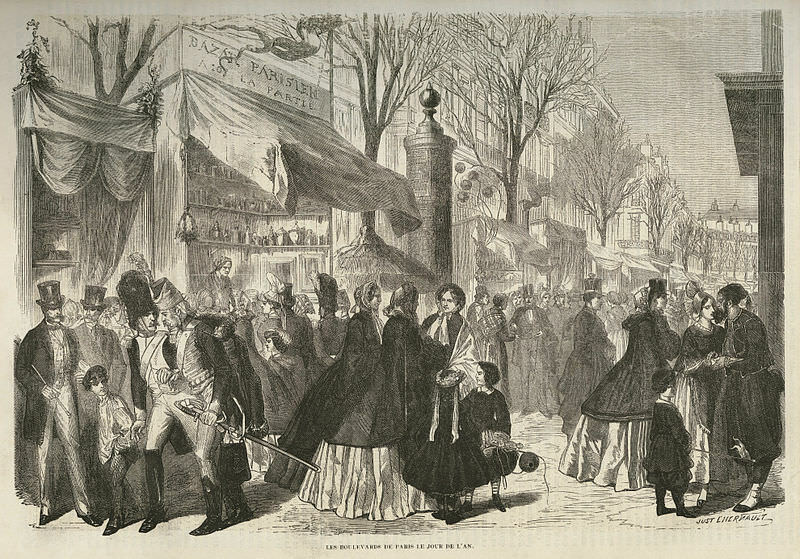 New Year’s Day was a bigger celebration than Christmas in 19th-century France. 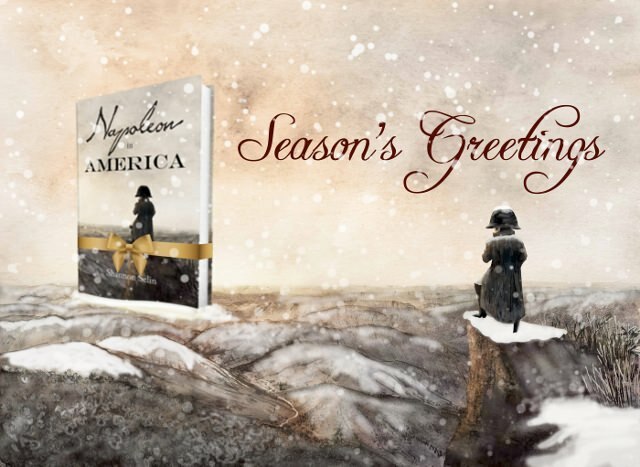 “Le Jour de l’An, as the French emphatically call it – the day of the year – the day of all others – is a holiday indeed,” reported a London newspaper in 1823. 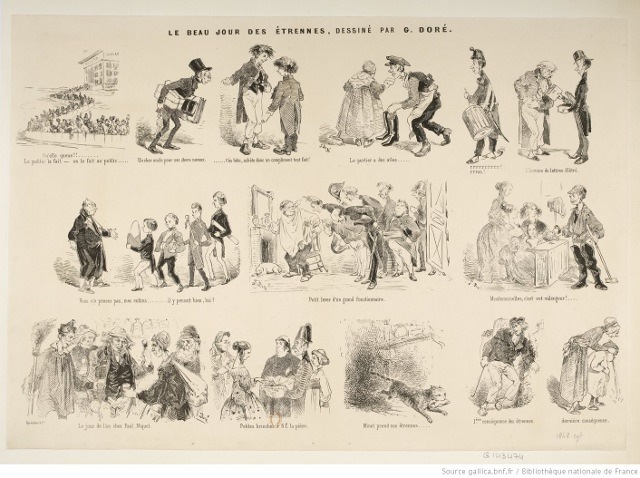 (1) New Year’s Day in Paris was particularly festive, as described in the following accounts. “New Year’s Day in Paris is the most remarkable day in the whole year; all the shops are shut; labour suspends his toil; commerce reposes on her oars; and the philosopher postpones his studies…. For several weeks preceding New Year’s Day, various classes of ingenious artists employ all their talents and skill to shine with an uncommon lustre on the auspicious opening of the New Year; these are the confectioners, the embossers of visiting cards, the jewellers, &c.; and their shops on this day display a degree of taste and magnificence difficult to describe, and totally unknown in England. This is the day of universal greetings, of renewing acquaintances, of counting how many links have been broken by time last year in the circles of friendship, and what new ones have replaced them. “The Jour de l’An is everybody’s holiday, the holiday of all ages, ranks, and conditions. Relations, friends, acquaintances, visit each other, kiss, and exchange sugar plums. For weeks previous to it, all the makers and vendors of fancy articles, from diamond necklaces and tiaras, down to sweetmeat boxes, are busily employed in the preparation of étrennes – New Year’s presents. But the staple commodity of French commerce, at this period, is sugar plums. At all times of the year are the shops of the marchands de bon-bons, in this modern Athens (as the Parisians call Paris), amply stocked, and constant is the demand for their luscious contents; but now the superb magasins in the Rue Vivienne, the splendid boutiques on the Boulevards, the magnificent depots in the Palais Royal, are rich in sweets beyond even that sugary conception, a child’s paradise, and they are literally crowded from morning till night by persons of all ages, men, women, and children. “Vast and various is the invention of the fabricants of this important necessary of life; and sugar is formed into tasteful imitations of carrots, cupids, ends of candle, roses, sausages, soap, bead-necklaces – all that is nice or nasty in nature and art. Ounce weights are thrown aside, and nothing under dozens of pounds is to be seen on the groaning counters; the wearied vendors forget to number by units, and fly to scores, hundreds, and thousands. But brilliant as are the exhibitions of sugar-work in this gay quarter of the town, they must yield for quantity to the astounding masses of the Rue des Lombards. That is the place resorted to by great purchasers, by such as require not pounds, but hundred weights for distribution. There reside all the mighty compounders, the vendors at first hand; and sugar-plum makers are as numerous in the Parisian Lombard-street, as are the traffickers in douceurs of a more substantial character in its namesake in London. “The day has scarcely dawned, and all is life, bustle, and movement. The visiting lists are prepared, the presents arranged, the cards are placed in due order of delivery. Vehicles of all descriptions are already crossing and jostling in every part of the city. Fortunate they are who, unblest with a calèche or a cabriolet of their own, have succeeded in engaging one for the day at six times its ordinary cost. “That is Mademoiselle –, of the Theatre Français. Her first visit is to Monsieur –, editor of the – journal. Three days ago she received a hint that he had prepared a thundering article against her intended performance of Célimène, which she is to act for the first time on Monday next. The chased silver-gilt soupière at her side is a New Year’s present for Monsieur le Rédacteur. The article will not appear. Her performance will be cited as a model de grâce, d’intelligence, et d’esprit. “That? – Hush! Turn away, or he will call us out for merely looking at him. Tis Z–, the celebrated duellist. Yesterday he wounded General de B–, the day before he killed M. de C–, and he has an affair in hand for tomorrow. Today he goes about distributing sugar plums, as in duty bound, for c’est un homme très amiable. “I don’t know either of the two gentlemen who are kissing both sides of each other’s faces, bowing and exchanging little paper packets. The very old man passing close to them, in a single-breasted faded silk coat, the colour of which once was apple blossom, is the younger brother of the Comte de –. 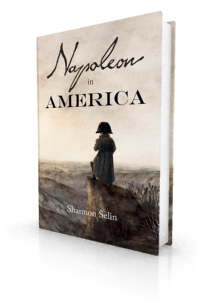 He is on his way to pay his annual visit to Mademoiselle –, who was his mistress some years before the breaking out of the Revolution. He stops to purchase a bouquet composed of violets and roses. Violets and roses on New Year’s Day! – his accustomed present. His visit is not one of affection – scarcely of friendship – c’est une affaire d’habitude. “I am of your opinion that Mademoiselle Entrechat, the opera dancer, is extraordinarily ugly, and of opinion with every one else, that she is a fool. She is handsome enough, however, in the estimation of our countryman, Sir X– Y– (who is economizing in Paris), because she dances, and has just sense enough to dupe him – very little is sufficient. Heaven knows! He is now on his way to her with a splendid cachemire and a few rouleaus. ‘Vraiment, les Anglais sont charmants.’ The poor simpleton believes she means it, and sputters something in unintelligible French in reply: at which Mademoiselle’s brother swears a big oath, that ‘Monsieur l’Anglais à de l’esprit comme quatre.’ Sir X– Y– invites him to dinner, but the Captain ‘makes it a rule to dine with his sister on New Year’s Day.’ O! If some of our poor simple countrymen could but see behind the curtain! But tis their affair, not mine. “In that cabriolet is an actress who wants to come out at the Comic Opera. What could have put it into her head that Monsieur L–, who has a voice potential in the Theatrical Senate, has just occasion for a breakfast service in Sèvres porcelain! “Behind is a hackney-coach full of little figurantes, who have clubbed together for the expense of it. They are going to étrenner the ballet-master. One does not like to dance in the rear where nobody can see her; another is anxious to dance seule; a third, the daughter of my washerwoman, is sure she could act Nina, if they would but let her try; a fourth wants the place of ouvreuse de loges for her maman, who sells roasted chestnuts at yonder corner. They offer their sugar plums, but, alas! they lack the gilding. Never despair, young ladies. Emigration is not yet at an end; economy is the order of the day in England, and Paris is the place for economizing in. Next year, perhaps, you too may be provided with eloquent douceurs to soften the hearts of the rulers of your dancing destinies. “New Year’s Day in Paris,” The Times (London), January 1, 1823, p. 3. “New Year’s Day,” Devizes and Wiltshire Gazette (Devizes, England), December 26, 1822, p. 2. The Parisians pay no honours to the old year; it has performed its office, resigned its place; it is past, gone, dead, defunct; all the harm or the good it could do is done, and there is an end of it. But what a merry welcome is given to its successor!